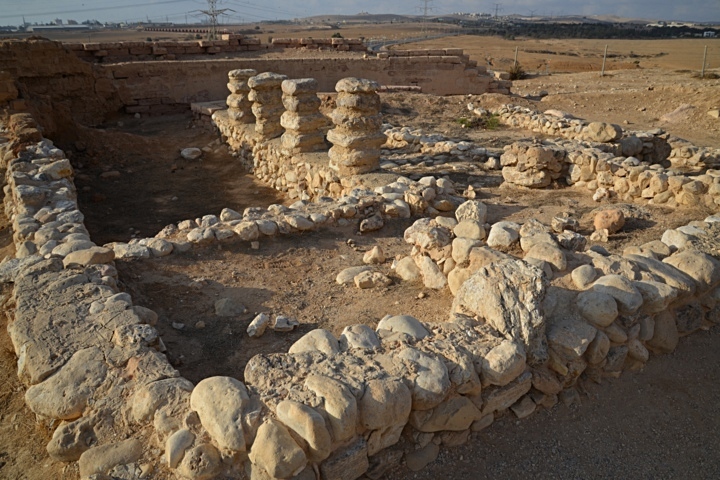 National park, with ruins of an Israelite Kingdom fortified administrative city, located between the Be'er Sheva and Hebron streams. 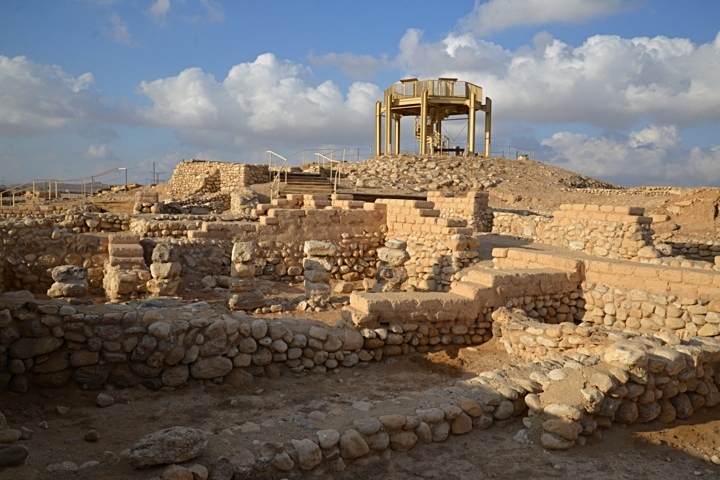 Genesis 26:33: "And he called it Shebah: therefore the name of the city is Beersheba unto this day". Tel Be'er Sheva is a National park, featuring the ruins of an Israelite Kingdom fortified administrative city. 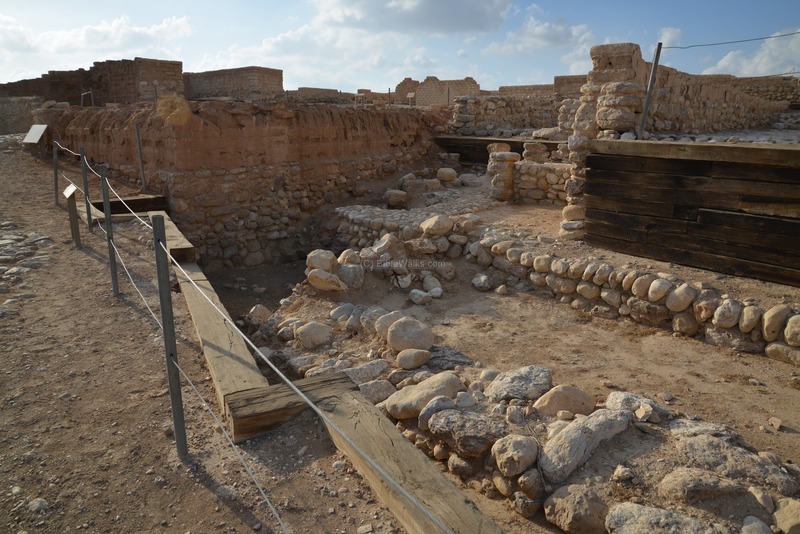 The ancient city is located between the Be'er Sheva and Hebron streams. 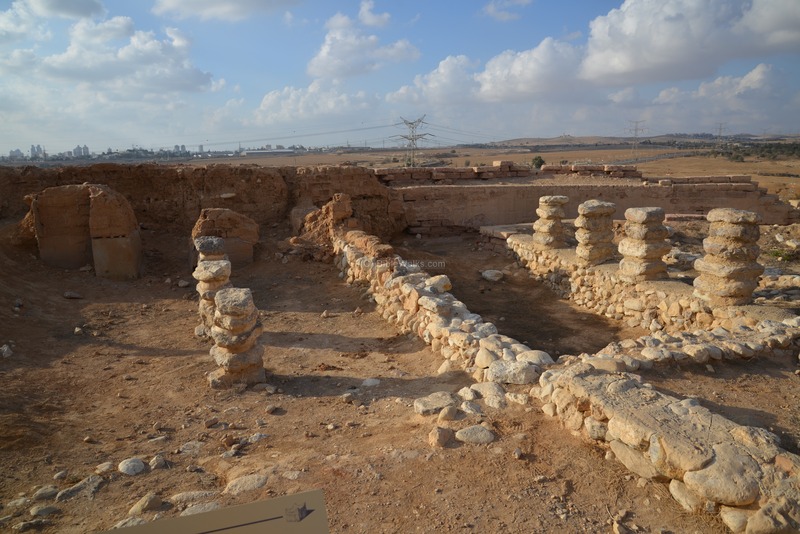 The Bible associated the acts of Abraham and Isaac to the name of the city, which reads in Hebrew as the "Well of the oath", or "seven wells". 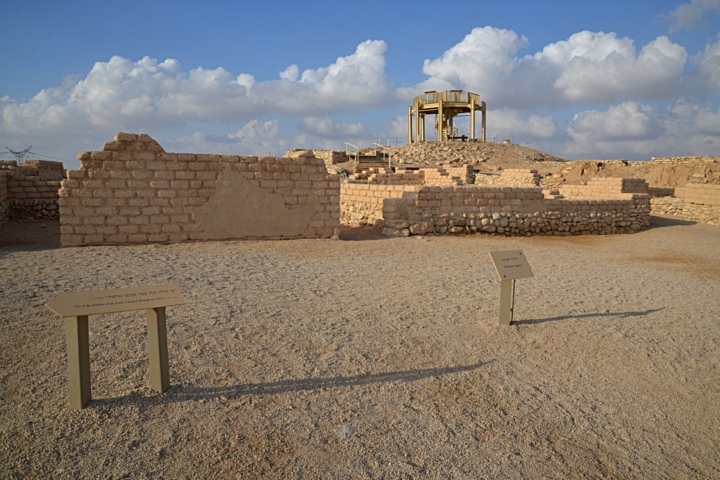 Tel Be'er Sheva national park is located east of Modern city of Beer Sheva. 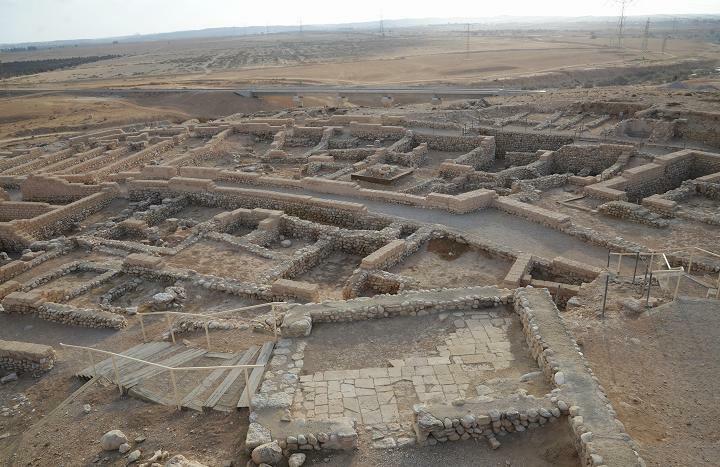 It is accessed via the road from Omer and Tel Sheva. The height of the mound is 307m, 25m higher than the surrounding valleys. 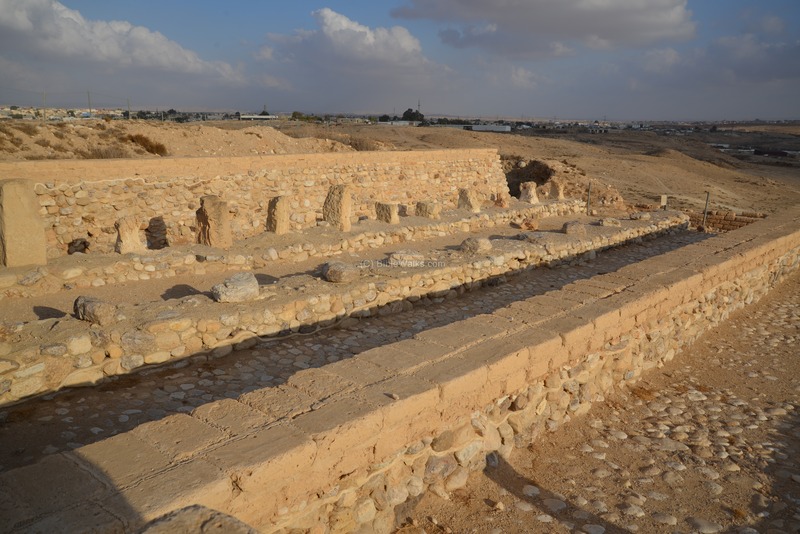 It is surrounded by two streams - Nahal Hebron (Wady el Khulil) and Nahal Beer Sheva (Wady es Seba) - which gave the ancient city a natural protection. 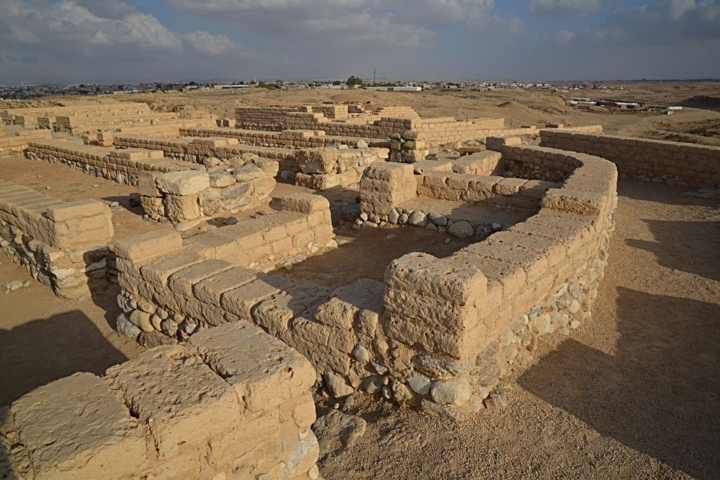 The Roman/Byzantine city moved westward to area of the modern city. 1st C B.C.-1st C A.D. 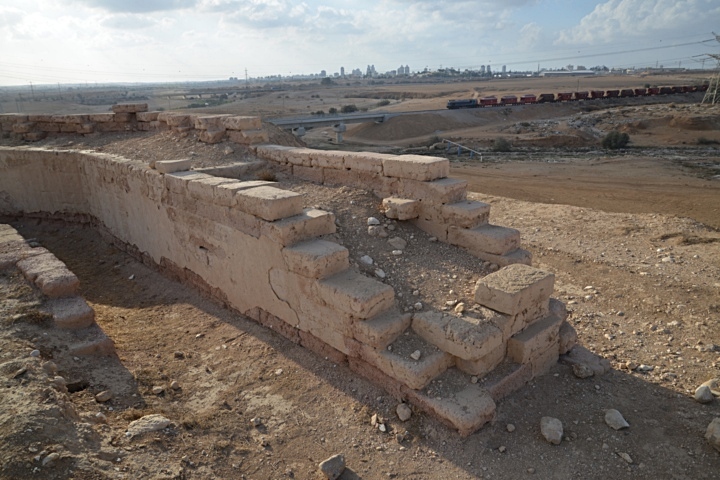 Most of the structures seen today on the mound belong to stratum 2, the Israelite city of the 8th Century B.C.. The city was destroyed by the Assyrians in 701 B.C. Tel Be'er Sheva was excavated from 1969 to 1975 (headed by Y. Aharoni) and in 1976 (headed by Ze'ev Herzog). In 1990 the site underwent extensive restorations. In 1986 the site was declared a national park. The water system was opened to the public in 2003. 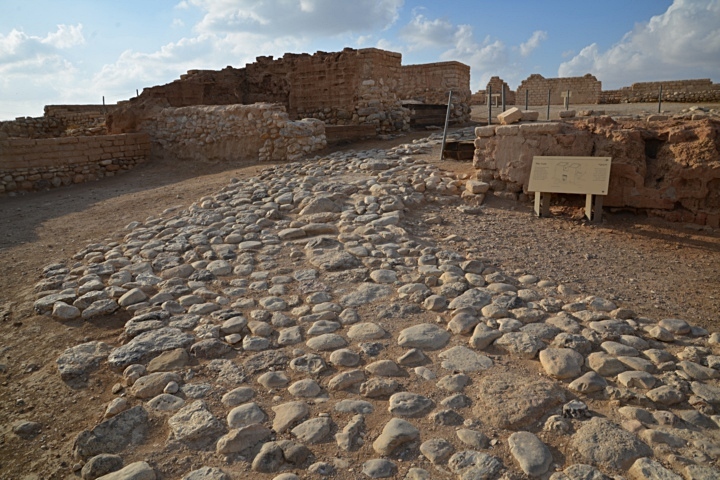 In 2005 UNESCO listed the Biblical mounds, including Tel Be'er Sheva, as a World Heritage site. 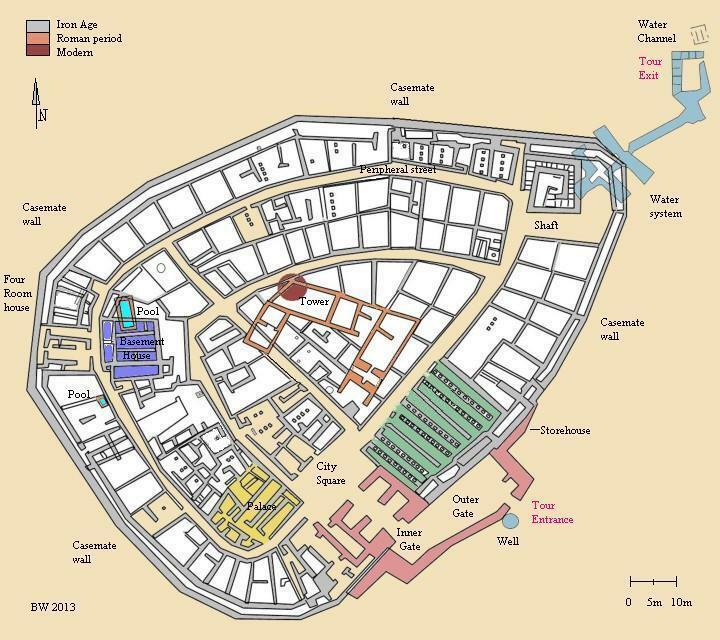 The plan of the ancient city, based on the excavation works, is illustrated below. 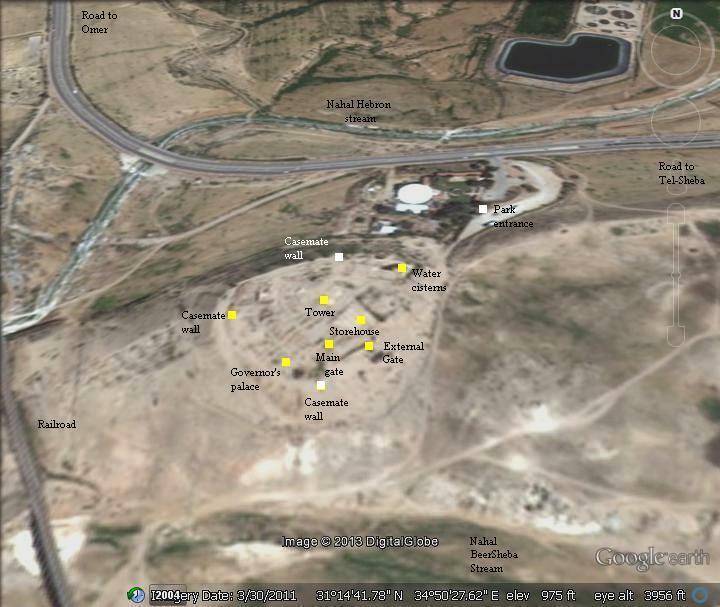 It has an oval shape, covering an area of 11 dunams (2.7 acres). 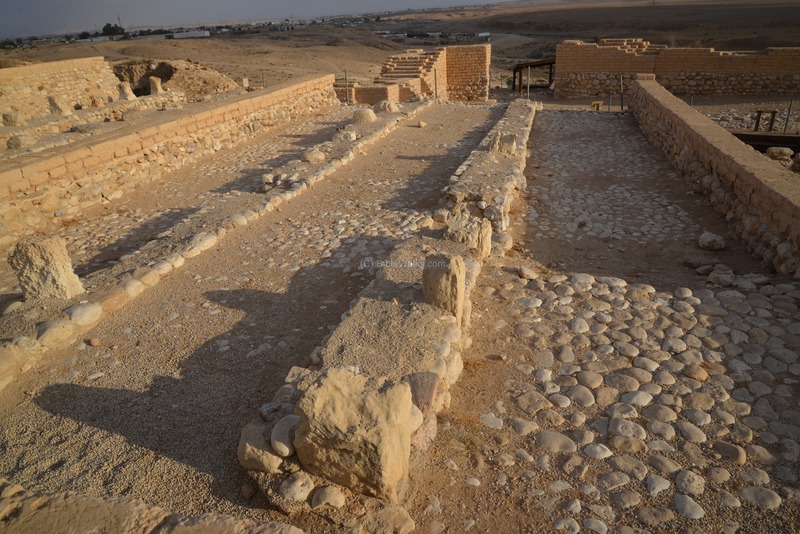 Most of the structures seen here are existing in the site, thanks to the outstanding reconstruction and conservation works. The city is protected all around with casemate walls - two parallel walls divide by partitions into rooms. 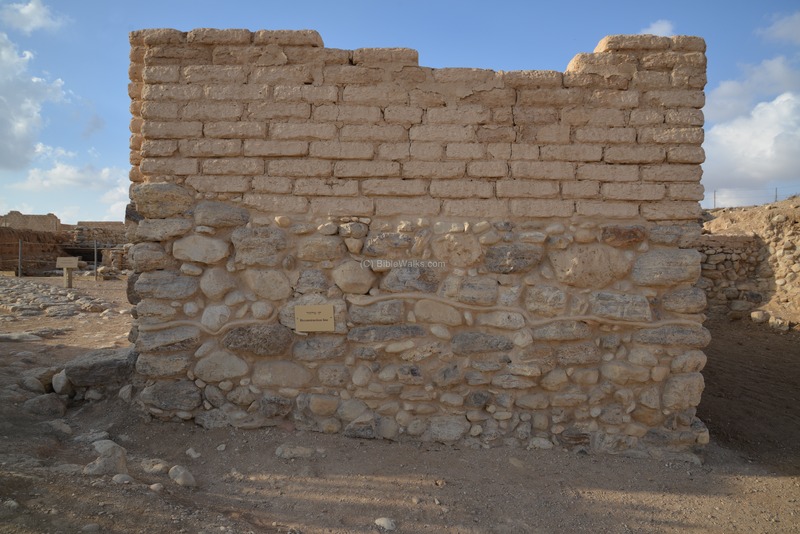 A cross section of theses walls can be seen on the west side, behind the four room house. The tour to the city starts from the outer gate (in pink color), on the east (right) side. After passing the outer gate, the path leads to the inner gate, with 2 chambers on both sides (also in pink color). Past the gate is the city square, and on its west side is the governor's palace (in yellow). A peripheral street leads around the city, in parallel to the external walls. To the east of the gate is a large store house (in green). On the west side is the "basement" house (in purple). Two pools are nearby, dated to the Herodian (Roman) period. In the center of the mound is a modern observation tower (marked in red). 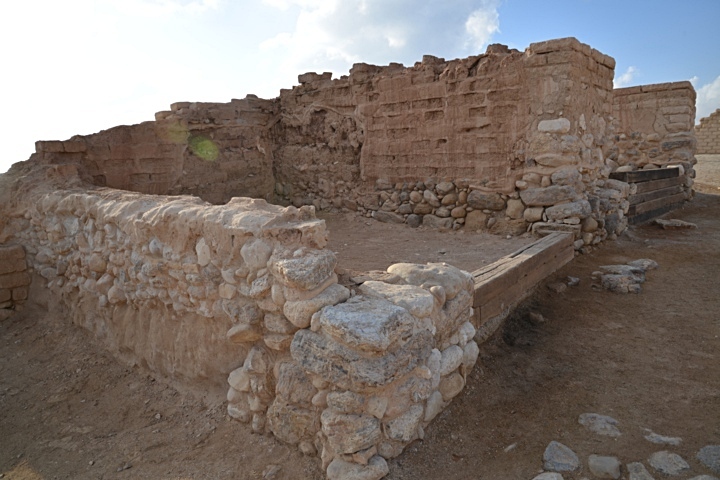 It is located above a structure dated to the Roman period (brown). The tour exists thru the water system (light blue), which is accessed by a stepped shaft. A smaller sized map is attached to each one of the sections below, indicating its location in the city. You can point on the points of interest to navigate to the selected place within this page. A southern section of the city is shown below, with indication of the major points of interest. 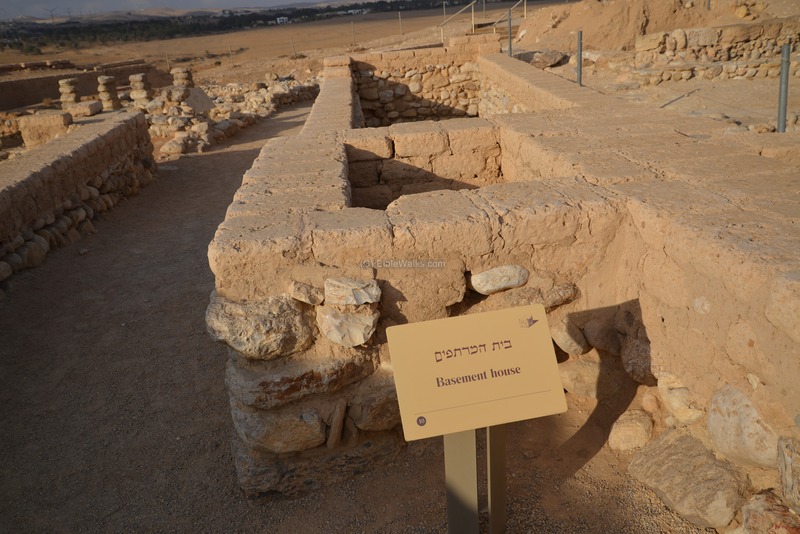 The photo section follows the order of the self-guided tour in Tel Beersheba. 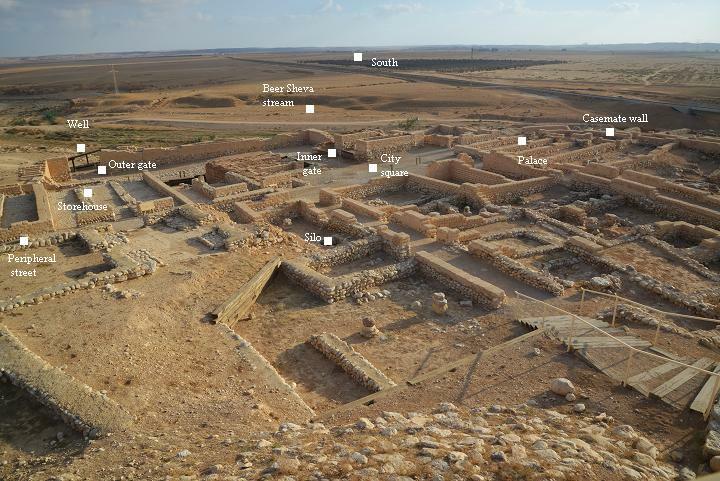 A drone view from the south side of Tel Beer Sheba is seen in this photo. On top of the oval shaped mound are the ruins of the Biblical city. Behind, on the left side is the visitor center. On the right side is the green valley of Nahal Beersheba stream. In the far background is the Bedouin township of Tel-Sheva (Tell as-Sabi). The following YouTube video shows a flight of a drone over the south side of the mound. In the entrance to the visitor's center is a reconstruction of the inner gate, with its design based on double chambers. A replica of the altar is located in the visitor's center. Its pieces were found incorporated in the walls of the storehouse, and is on display in the Jerusalem museum. 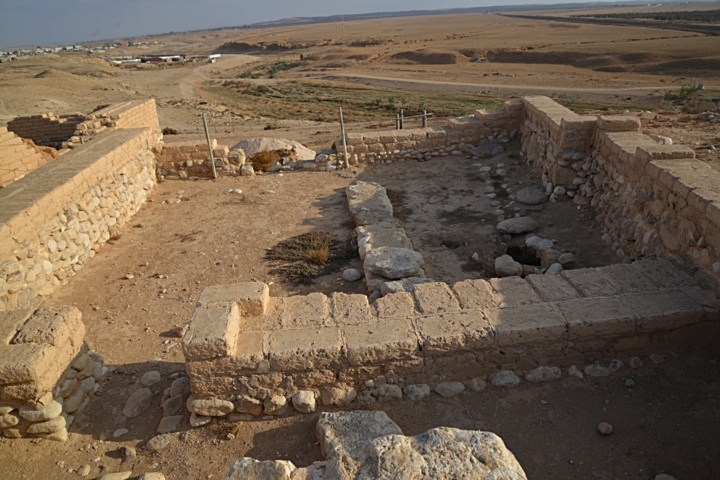 The four-horned altar was used for sacrifices, as mentioned in numerous places in the Bible (Leviticus 8:15): "And he slew it; and Moses took the blood, and put it upon the horns of the altar round about with his finger, and purified the altar and poured the blood at the bottom of the altar and sanctified it, to make reconciliation upon it". 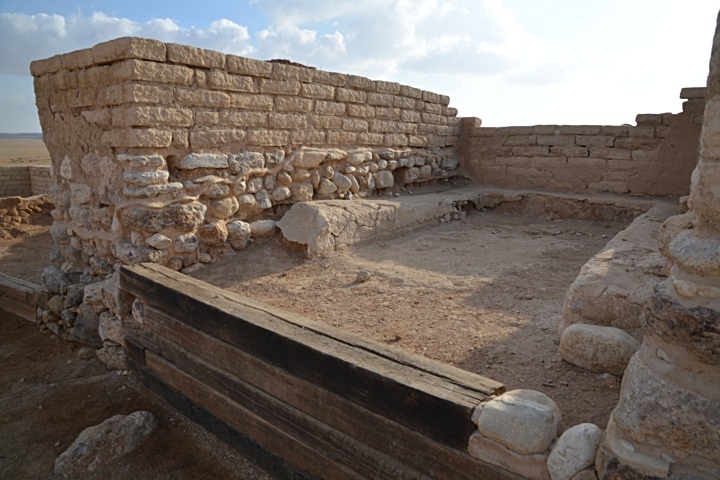 This altar may have been destroyed, then buried, as described by the Bible related to the sweeping ritual reforms of King Hezekiah, who centralized the worship of God in Jerusalem, and abolished the ritual high places elsewhere (2 Kings 18: 1, 4): "Now it came to pass in the third year of Hoshea son of Elah king of Israel, that Hezekiah the son of Ahaz king of Judah began to reign.... He removed the high places, and brake the images, and cut down the groves...". 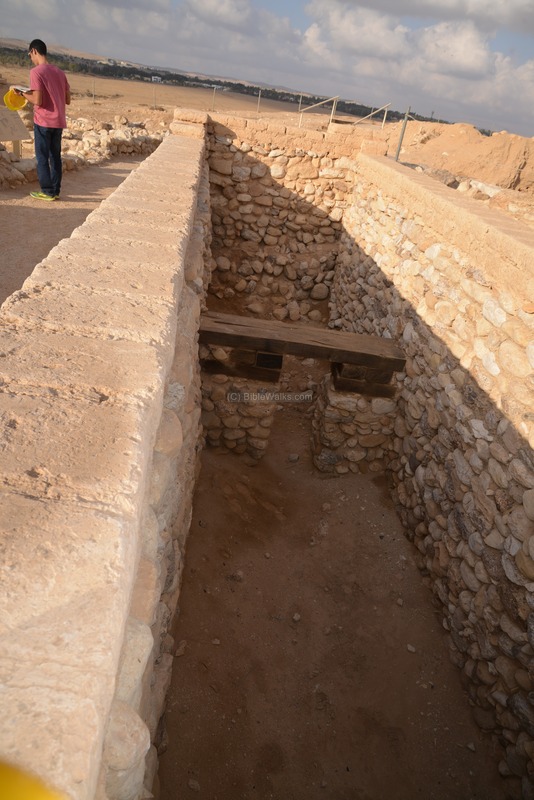 A deep well is located on the southwest side of the city, adjacent to the outer gate. 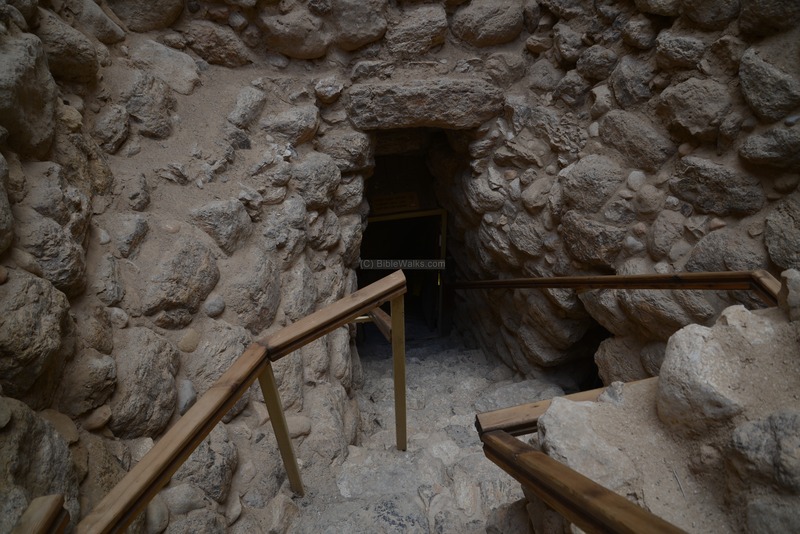 This hewn well, 70m deep, reaches a depth 50m lower than the level of the valley of Beersheba stream. This depth gave the well a year round supply of water. 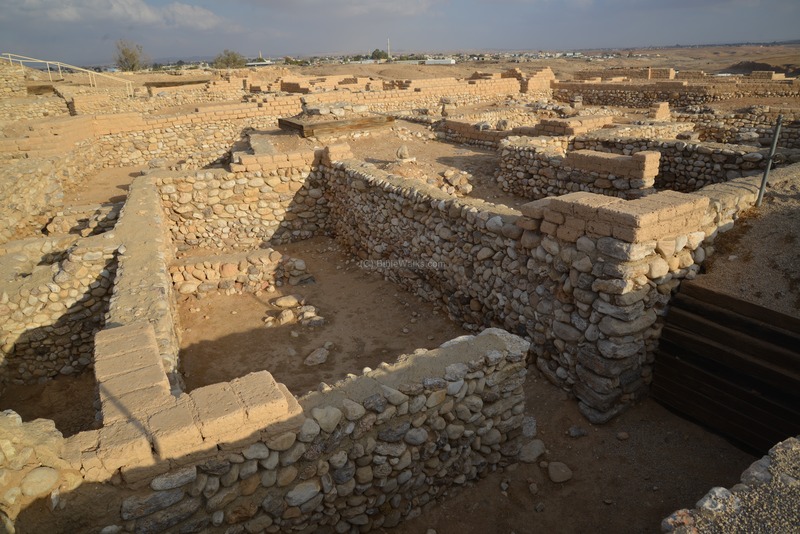 It may have been hewn in the time of Iron Age stratum 9 (12th-11th Century B.C.). The location of the well is illustrated on the right, marked as a red square on the plan. It is the first station along the city tour. In the photo below is the reconstructed water system, and in the far background is the wide valley of Beersheba stream. 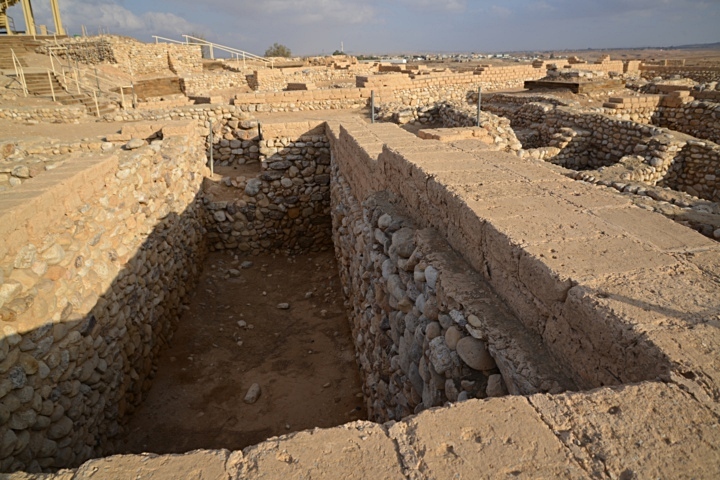 The digging of the well is mentioned by the Bible in two cases1, both of them naming the city after the alliance with the Philistine king Abimelech. The Bible explains the name of the well as being based both on the Hebrew word "Sheva" (meaning: seven), and also the root word of "oath". 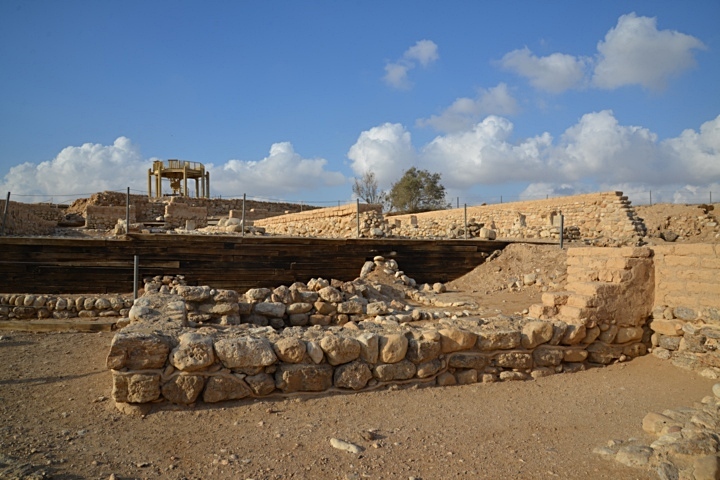 The first case is about Abraham's alliance, which was arranged after a quarrel over the well hewn by Abraham's servants, but repossessed by Abimelech's men (Genesis 21 27-32): "And Abraham took sheep and oxen, and gave them unto Abimelech; and both of them made a covenant. And Abraham set seven ewe lambs of the flock by themselves. And Abimelech said unto Abraham, What mean these seven ewe lambs which thou hast set by themselves? And he said, For these seven ewe lambs shalt thou take of my hand, that they may be a witness unto me, that I have digged this well. Wherefore he called that place Beersheba; because there they sware both of them. Thus they made a covenant at Beersheba: then Abimelech rose up, and Phichol the chief captain of his host, and they returned into the land of the Philistines". The second case is told in connection to Abraham's son, Isaac, who wandered south on his way to Egypt during the feminine years. 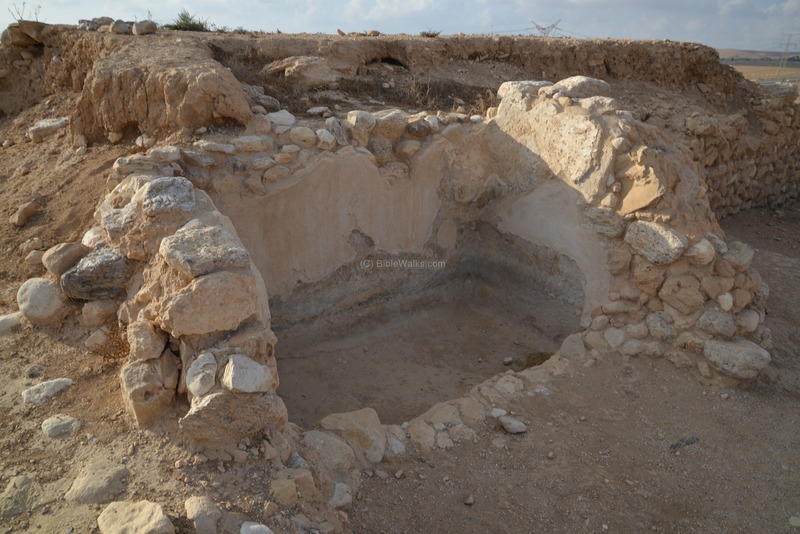 Once again, the Philistines attempted to posses the well hewn by the Hebrews, and the new alliance based the name of the city on the "oath" (Genesis 26: 23,33): "And he went up from thence to Beersheba... And it came to pass the same day, that Isaac's servants came, and told him concerning the well which they had digged, and said unto him, We have found water. And he called it Shebah: therefore the name of the city is Beersheba unto this day". Note 1. Having two multiple instances of the same story is common in other Biblical stories. It may be explained by the fact that the writer incorporated different versions which have existed at the time of the compilation of the book. 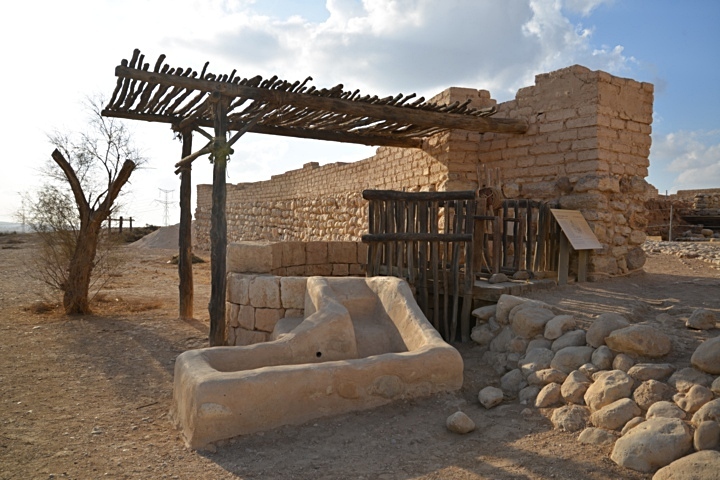 The following photo shows a reconstruction of the water system around the well, serving the inhabitants of the city, its visitors and the livestock. 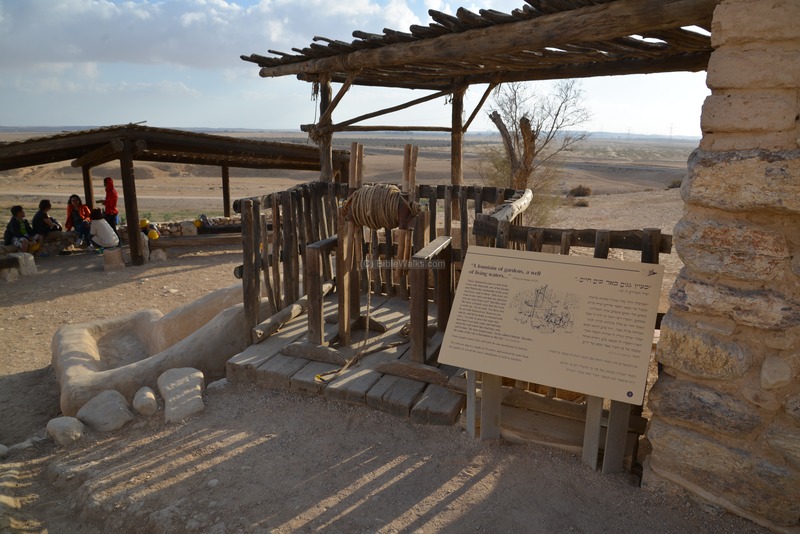 As the Negev desert is dry, the well was the source of life. The outer gate is adjacent to the well. This gate was a secondary protection, in addition to the main inner gate. It was part of the stratum 4/5 city, but later dismantled. The location of the outer gate is illustrated on the right, marked as a red square on the plan. The photo below shows a view of the outer gate from the north side. 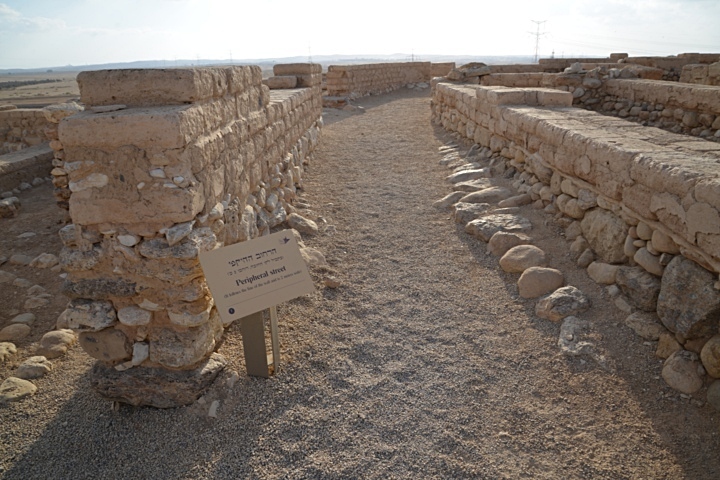 The base of the wall is made of rough stones, as seen in the photograph below. The upper section of this corner tower, which was reconstructed, is made of sun-baked mud bricks. 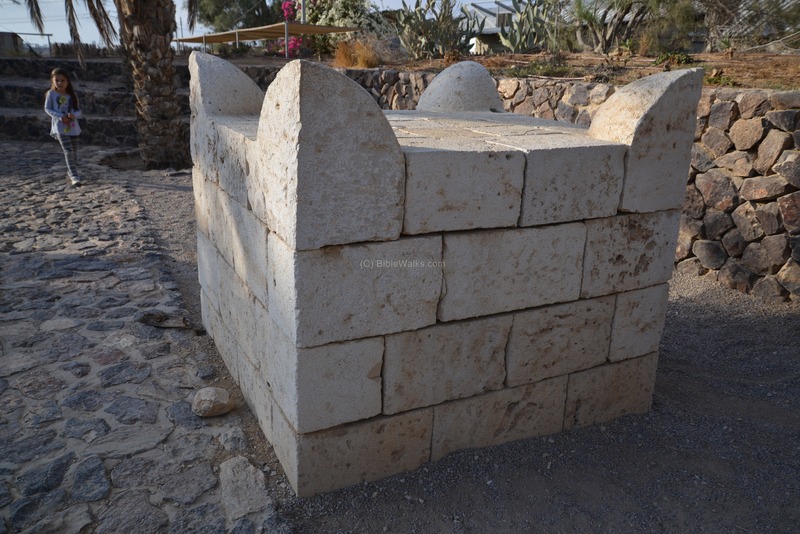 The stone based foundation is intended to reinforce the mud bricks wall, and prevent water to weaken the foundations. The reconstruction line of the northwest tower is marked along the wall. On the inner side of the outer gate, facing the gate opening, is the base of a room that protected the entrance. A paved street leads from the outer gate to the inner gate, which was the main gate. Under the pavement is a drainage channel, which used to lead the surplus rain water from the city to the well, or to a reservoir outside of the walls. 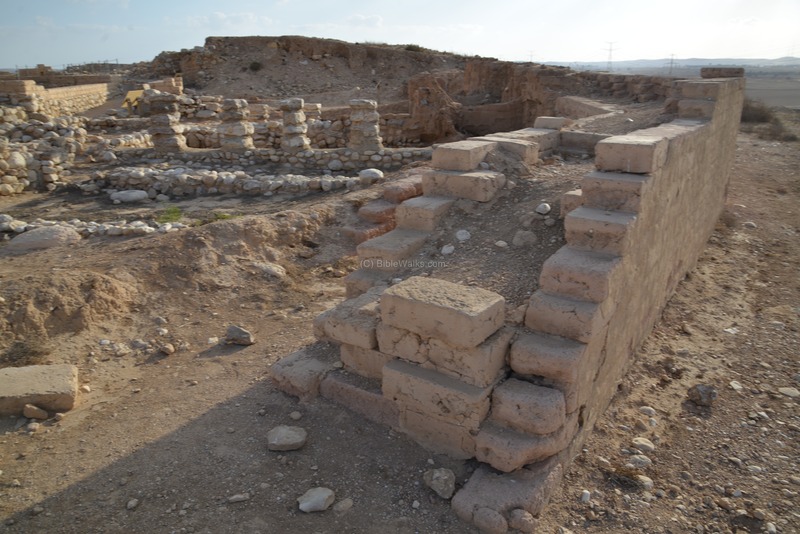 During the 8th Century B.C., the outer gate was removed. The solid peripheral wall was replaced by a casemate wall. 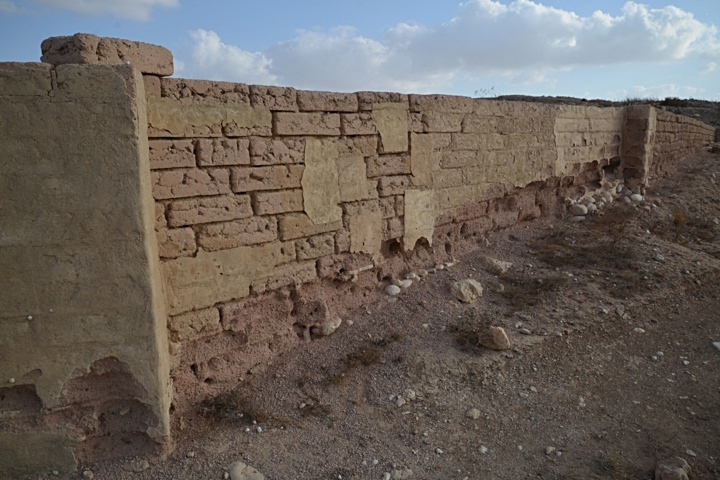 This wall, of the Stratum 2/3 city, is seen on the northwest side of the entrance street. The inner gate was the main gate of the city, and was planned with design which was common in the Israelite Kingdom cities. The location of the inner gate is illustrated on the right, marked as a red square on the plan. A south view of the remains of the gate is seen in the photo below. The front of the gate was protected by two high, thick walled towers on each side. 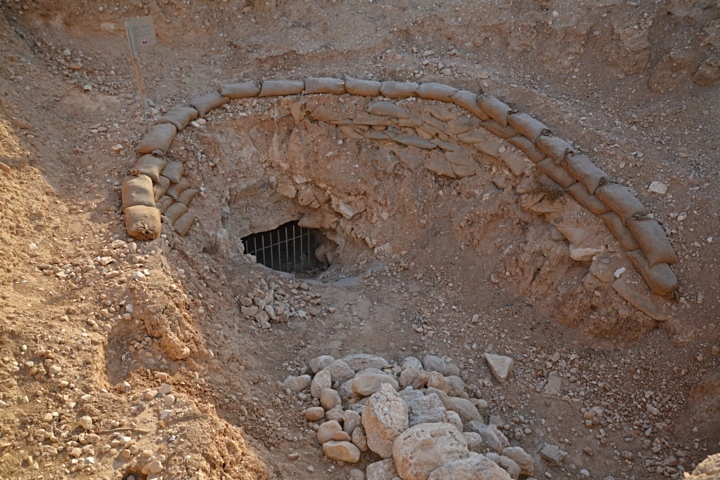 This dual-chamber design is common to other ancient cities in Israel. This view is of the left side of the entrance. 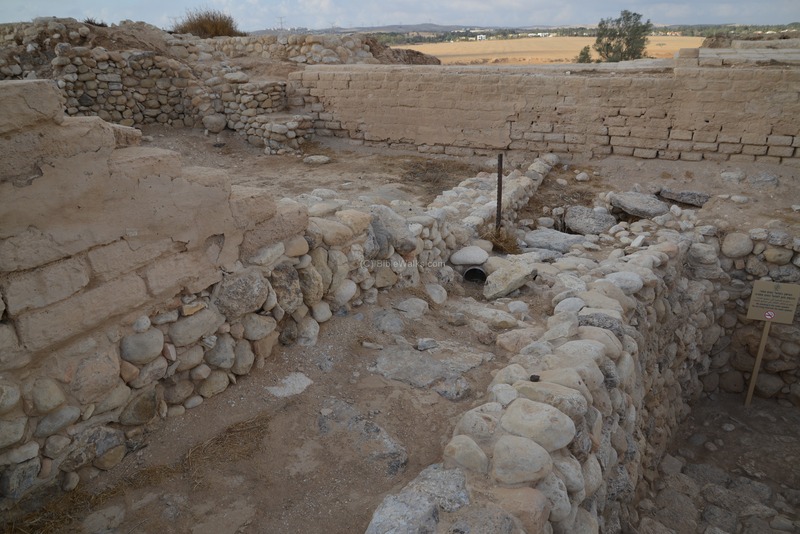 The chambers are dated to the 8th Century (Stratum 2/3), which was built over the earlier gate (Stratum 4/5 of the 9th Century). Plastered benches are located around the inner side of one of the chambers. These benches were used during peaceful times as seats for visitors and merchants, and served as a reception area for the adjacent palace of the Governor. 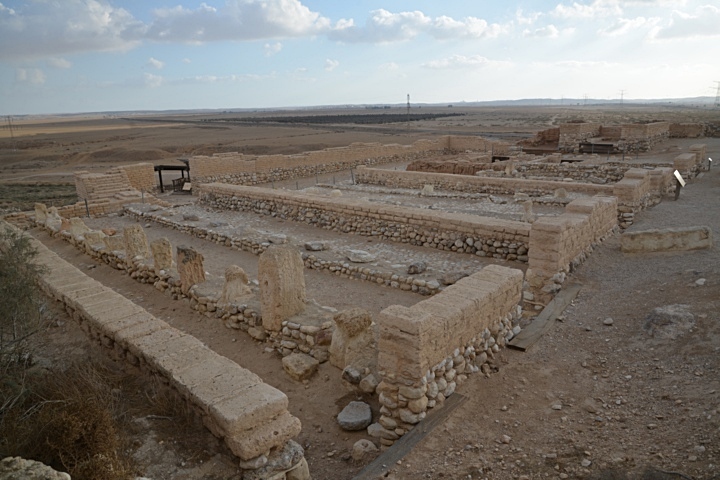 This was also the place of elders, as described in numerous places in the Bible (Deuteronomy 21:19): "...bring him out unto the elders of his city, and unto the gate of his place;". 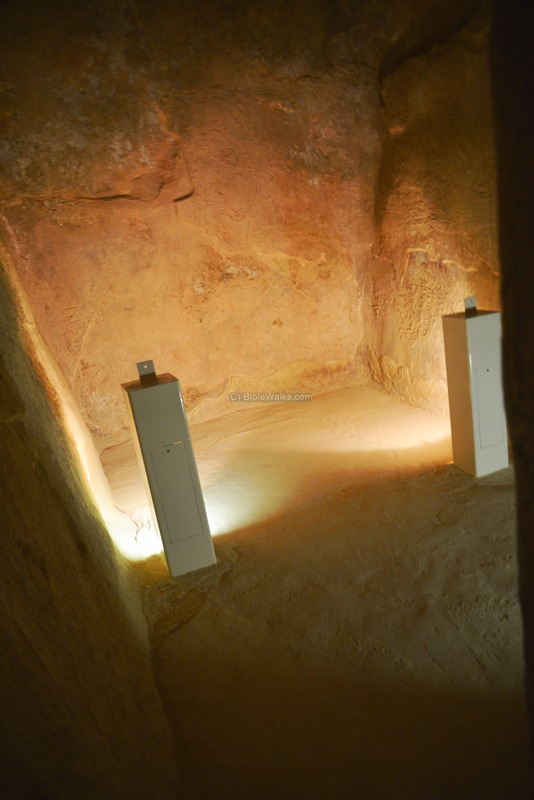 On the right side of the entrance are two more chambers, but here the archaeologists removed the 8th Century towers, leaving the base of the earlier city gate (stratum 4/5) which is lower in height. After passing the inner gate, you enter an open courtyard. This was the only open space inside the city, and used as a public gathering place and market. The location of the city square is illustrated on the right, marked as a red square on the plan. The city square is well connected to other sections of the city, with four main streets originating from it. A peripheral street, starting at both ends of the square, surrounds the oval outline of the city. 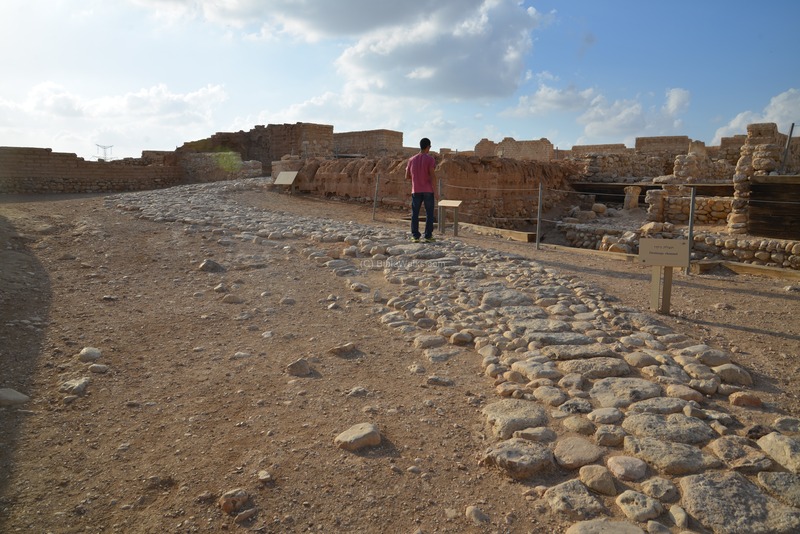 The 2m wide street, seen in this photo, is aligned with the external city walls. Two other streets, with a northwest direction, originate from the square. 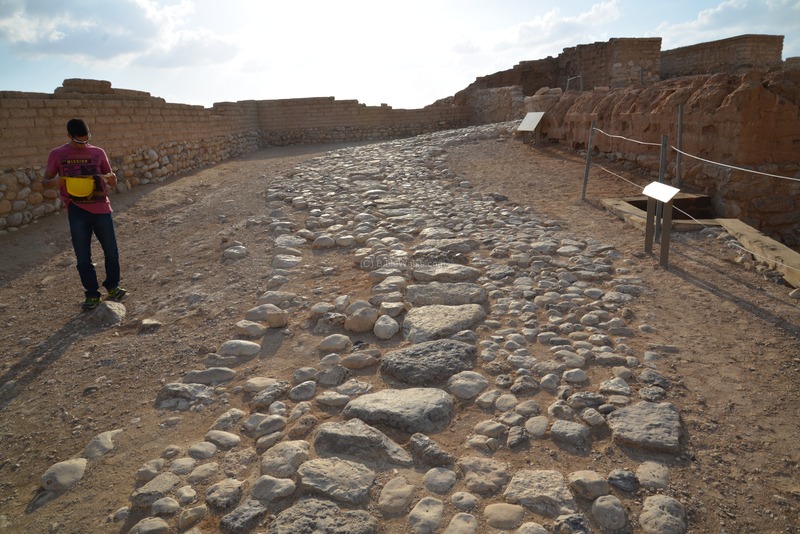 An area dug into the peripheral street on the west side of the city shows that it actually followed the route of an earlier street dated to the 9th Century (Stratum 4/5). Therefore, the city plan was not changed between the earlier stage (4/5) and the new stage (2/3) of the city construction. 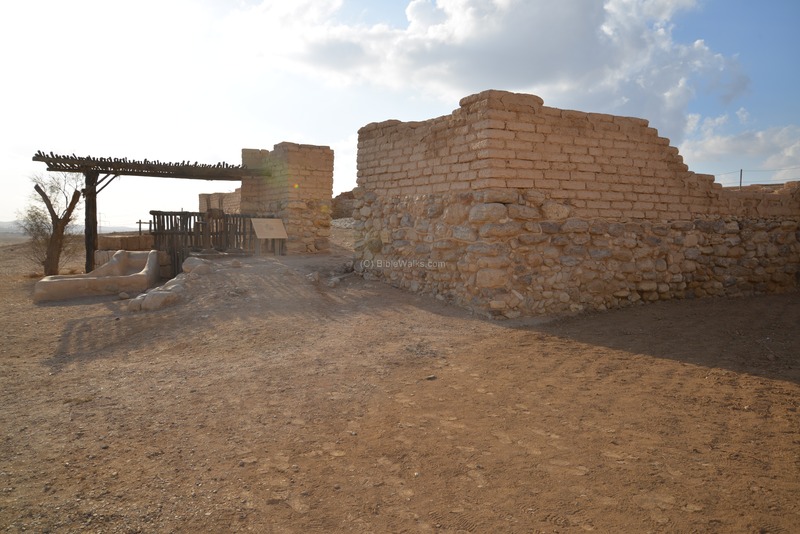 On the south side of the gate is one of the structures, dated to the 8th Century B.C. (Stratum 2/3). The location of the structure is illustrated on the right, marked as a red square on the plan. The entrance to the structure, as seen from the city square, is seen in the following photo. 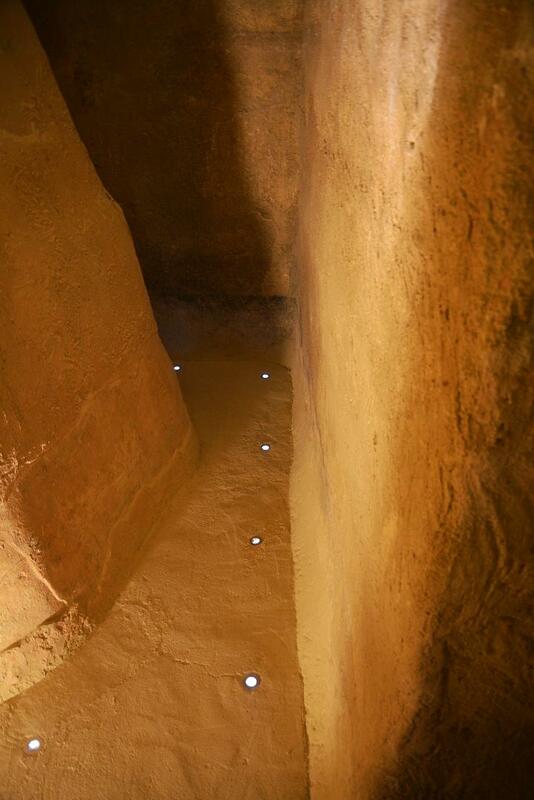 Notice the drainage channel, that collects the rainfall waters into cisterns. 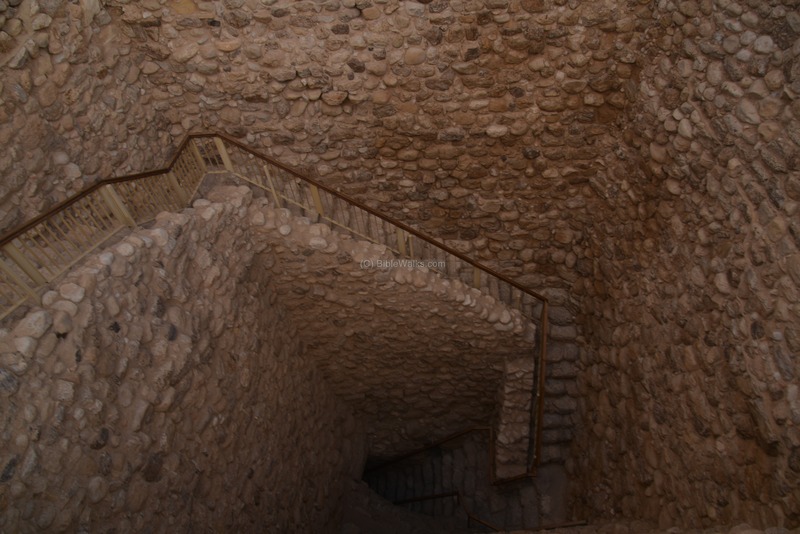 Steps, located near the entrance, lead to the upper story (now missing). 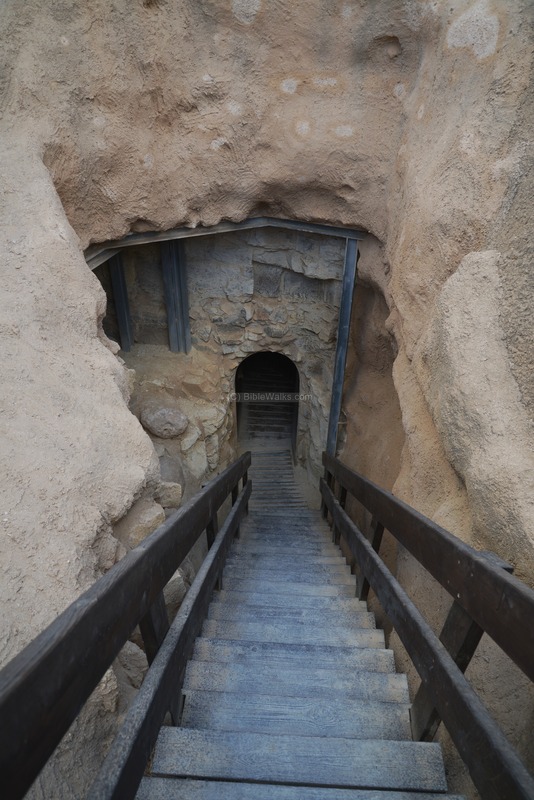 Perhaps these steps were the access to the top of the gate towers. 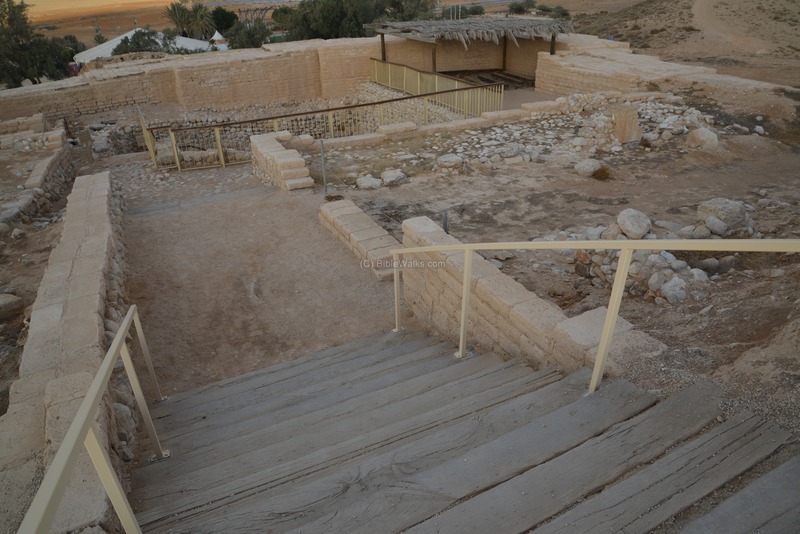 From the top of these steps is a better view of the structure. The southeast far end of the structure is adjacent to the city's casemate wall, and the edge of the gate towers are on the left side. 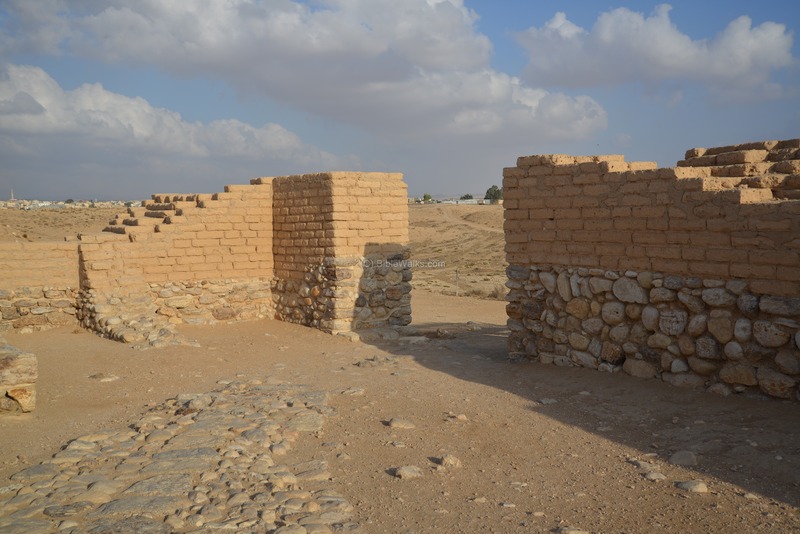 The foundations of the walls are based on fieldstones, while the top of the wall is composed of sun dried mud bricks. 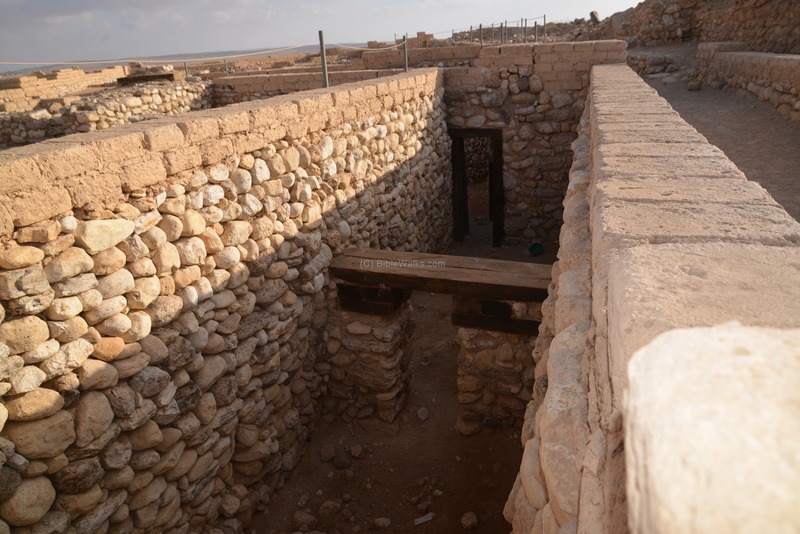 A view from the inner side of the structure is shown in the following photo. Notice the drainage channel. A large structure is located on the southwest side of the city square. 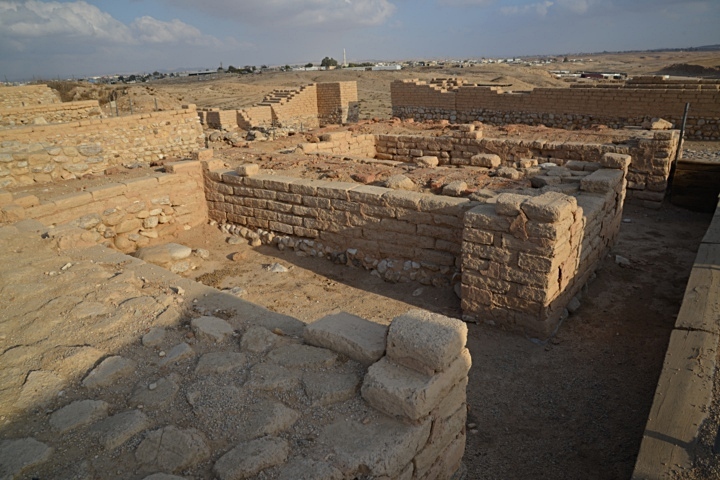 Its size and plan indicates that the structure was the house of the governor of the city. The location of the palace is illustrated on the right, marked as a red square on the plan. The entrance corridor to the palace is viewed in the photograph, from the east side. Two large paved halls, serving as the ceremonial wing, open on the right side. The next picture is a view of the palace from the peripheral street. The two long halls are seen on the right side. The palace also included residential units, a kitchen and storeroom. The locations of two of the Roman period pools are illustrated on the right, marked as red squares on the plan. Remains of a plastered pool are seen on the left side of the peripheral street, on the west side of the city. 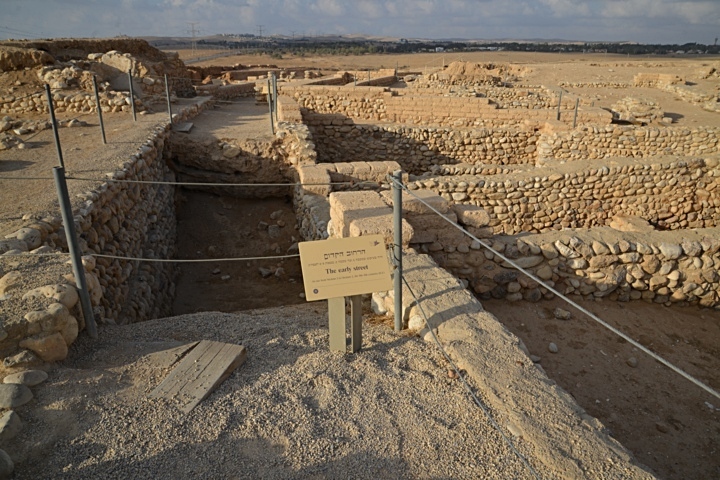 The pool was constructed at a later date - the Herodian period (1st Century B.C.-1st Century A.D.) - when a large Roman fortress was built in the center of the city. On the west side of the city is a structure whose foundations are of an unusual depth - 4 meters under the street level. The location of the "basement" house is illustrated on the right, marked as a red square on the plan. The photo shows the south side of the structure. The lower level of the foundation is explained by scholars as the result of the sweeping ritual reforms of King Hezekiah, who centralized the worship of God in Jerusalem, and abolished the ritual high places elsewhere (2 Kings 18: 4): "He removed the high places, and brake the images, and cut down the groves...". 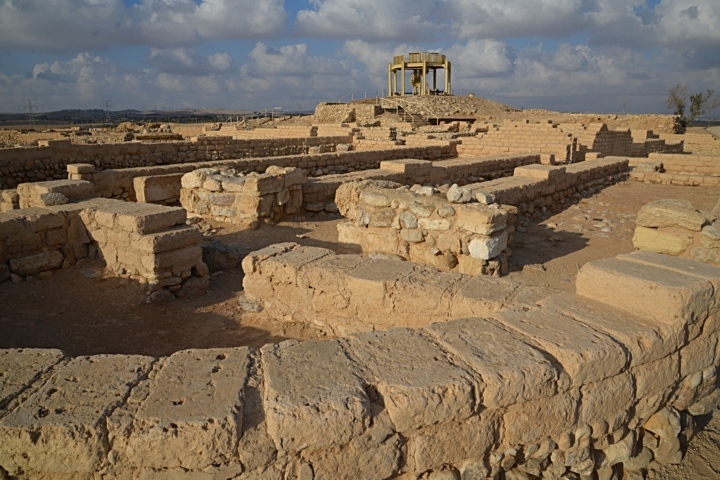 At that time, 8th Century B.C., the temple was removed at this site, bringing down the level of the structure. 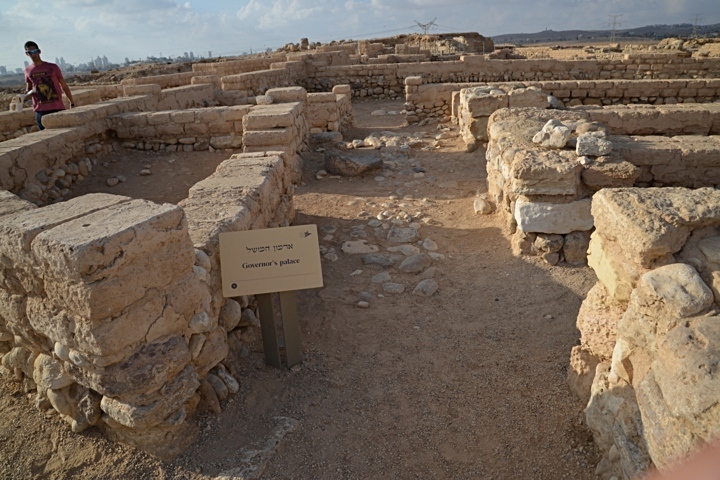 A typical house design in the Israelite period was based on the "four-room house", which was three parallel spaces with a perpendicular space to them. A view from the east side of such design is shown below. The "four-room house" design was a compact house with thick external walls and a single entrance, designed for protection. 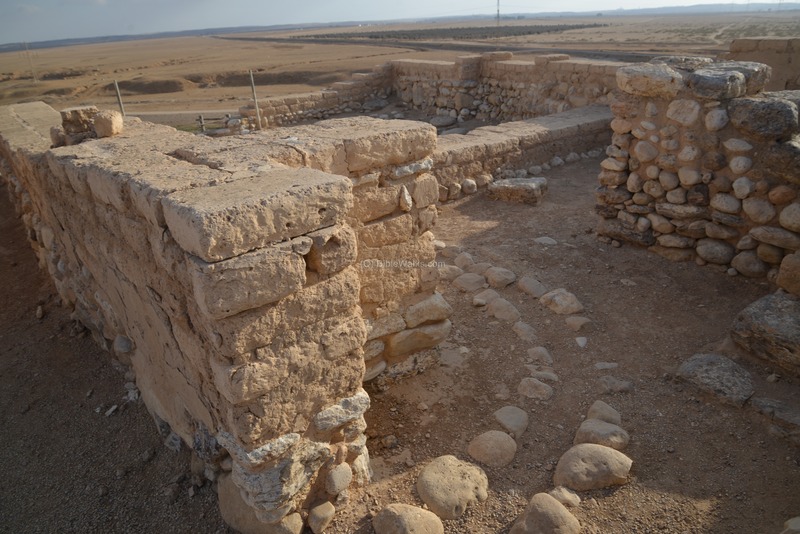 It supported a roof, or even a second level where additional residential rooms were located. 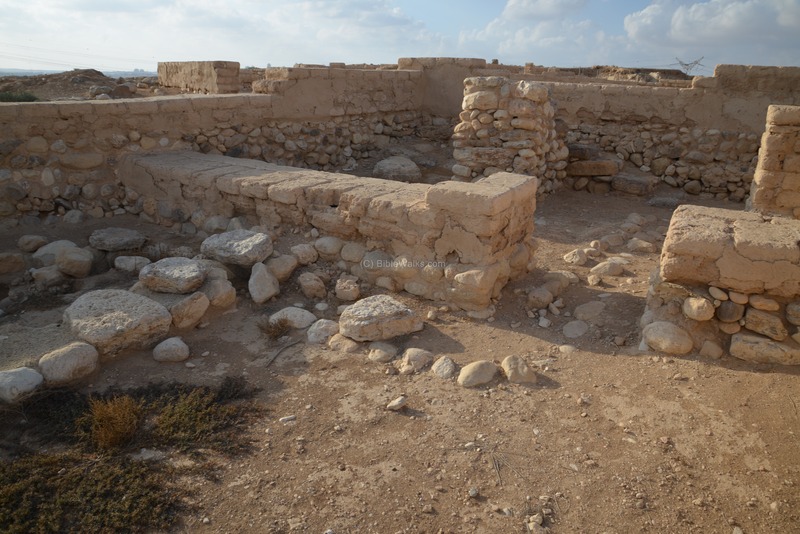 This was a dwelling place for the family, kitchen, storerooms and also a place for the cattle (ox and mules). The standard type was a rectangular design covering a total area of 150-200 square meters. The design was based on a long house with four main spaces - a broad room in the back and three long spaces extending forward from it. The rooms were divided by stone pillars and walls. The central room was a courtyard, which was normally open to let in light since there were no windows in the house. Around the 8th Century city (Stratum 2/3) was a casemate wall, which was common at the Israelite period. The location of this section of the casement wall is illustrated on the right, marked as a red square on the plan. 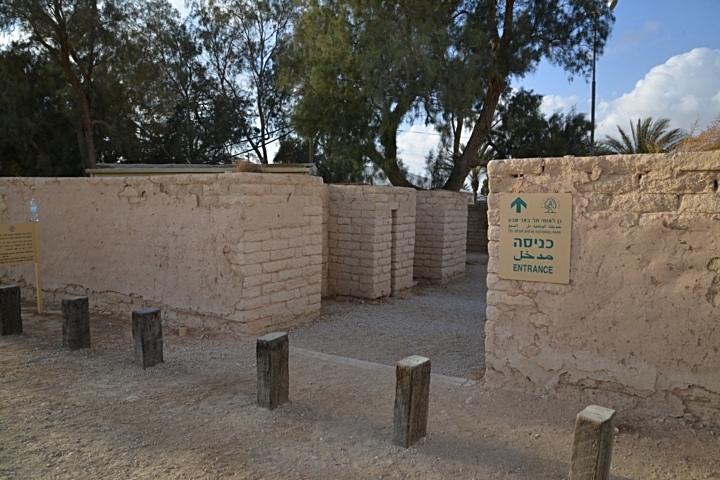 The casemate form (Hebrew: "Sogarim") is based on two parallel walls (one external and one internal), which are connected at small intervals with inner walls, thus creating chambers. The chambers - 4m wide - were used for storage and dwelling, and during war it could be reinforced by filling them with earth. Adjacent to the casement wall, on the inner side, are dwellings. These houses, which are integrated into the wall, included three or four rooms: one room served as a courtyard and cooking area, with steps that led to a second level or the roof; two storage rooms, one used for the animals; and a bedroom along the casemate wall. The following picture shows the outer side of the wall. The plaster on the wall protected the sun baked mud bricks from the effect of the water and wind. 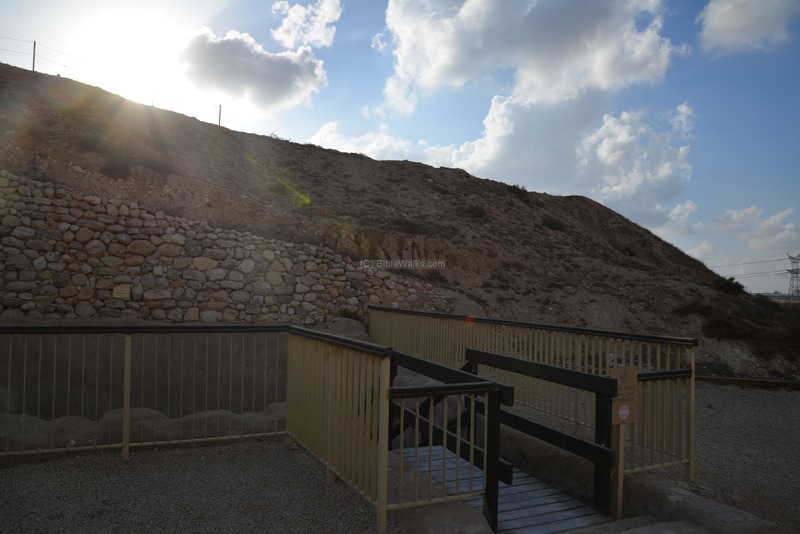 Hundreds of years later than the Israelite period, a Roman fortress was constructed on the top of the mound. 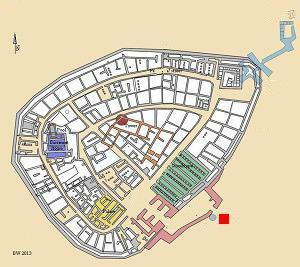 The location of the Roman period structures is illustrated on the right, marked as a red square on the plan. Its remains are located on the south side of the observation tower. A section of the fortress is shown below, as viewed from the modern observation tower. The fortress was restored in the Early Arab period (7th-8th Century A.D.). In the center of the mound is an observation tower. 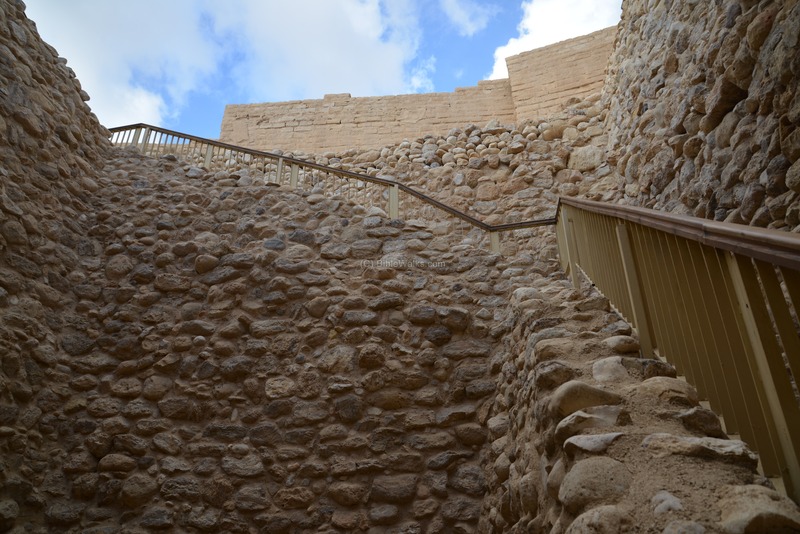 A spiral staircase leads up to the balcony, where you can view the entire ruins, and the area around Tel Beer Sheva. The location of the tower is illustrated on the right, marked as a red square on the plan. A panoramic view of the sights around the lookout tower is seen in this next photo. Pressing on this picture will pop up the panoramic viewer. Using this flash-based panoramic viewer, you can move around 360 degrees, zooming in and out - viewing the site in the amazing full screen mode (like you are really there). Points of interest are indicated on the view. It may take minutes to upload, but then its worth the waiting time. 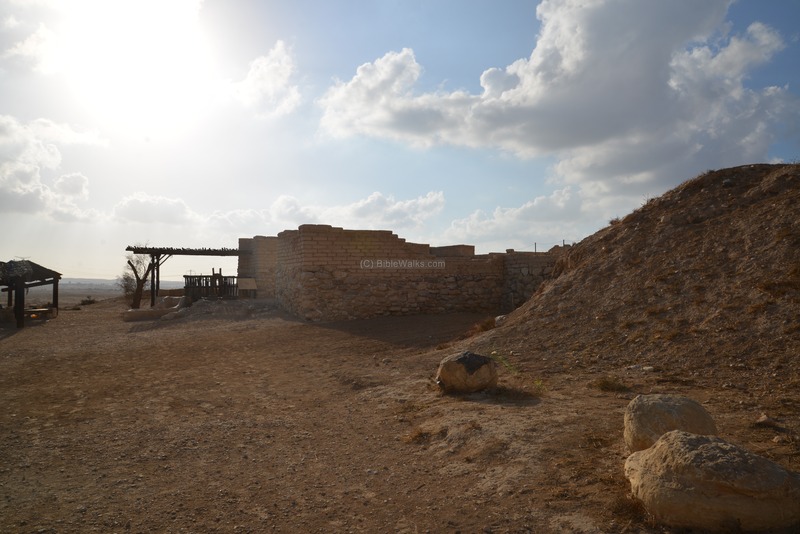 The storehouse is located near the main gate. Its location is illustrated on the right, marked as a red square on the plan. The 600m2 structure is divided into three long halls, divided by two rows of stone pillars. The middle hall was used as a passage for the donkeys carrying the supplies, which were stored on the two side halls. Hundreds of ceramic vessels were found in the ruins of the storehouse. 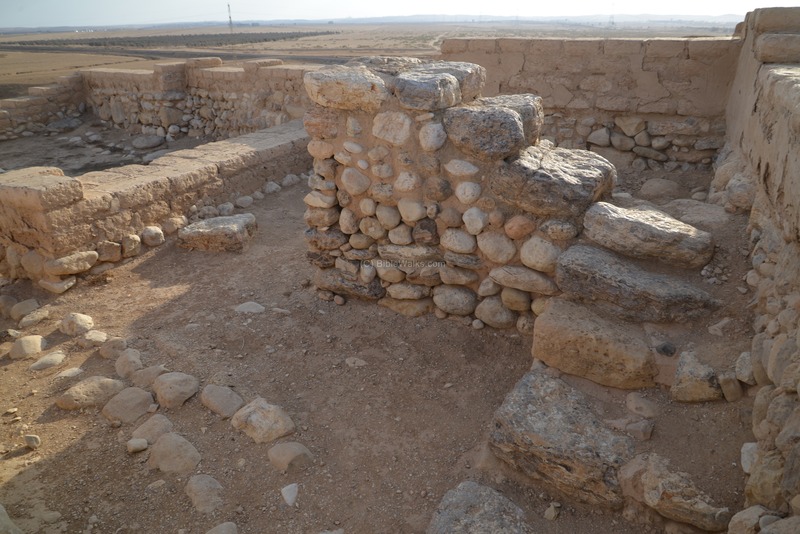 The Bible writes about Hezekiah who built such storehouses, and this may have been one of the storage complexes which he built. (2 chronicles 32: 27-29): "And Hezekiah had exceeding much riches and honor: and he made himself ... Storehouses also for the increase of corn, and wine, and oil; and stalls for all manner of beasts, and cotes for flocks. Moreover he provided him cities, and possessions of flocks and herds in abundance: for God had given him substance very much". 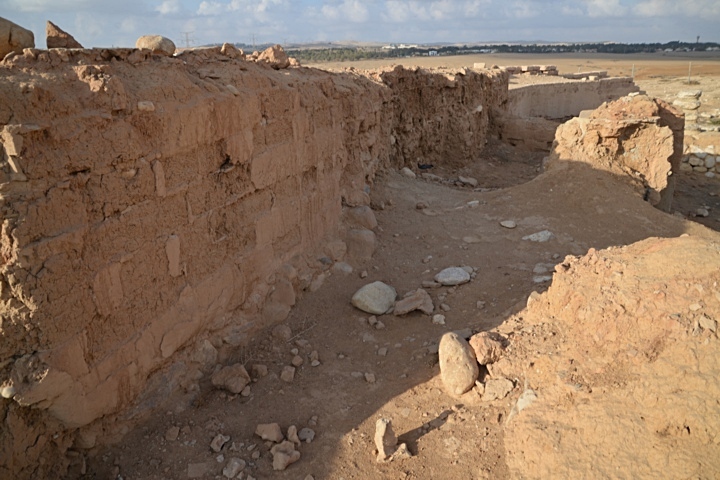 The archaeologist found pieces of a four-horned altar inside the ruins of the storehouse, which was incorporated into the wall of the northern corner, seen in the following picture. The underground water system is located on the northeast corner of the city. Its purpose was to store flood water from the Hebron stream, and surplus rainfall from the city, for the times of a siege. 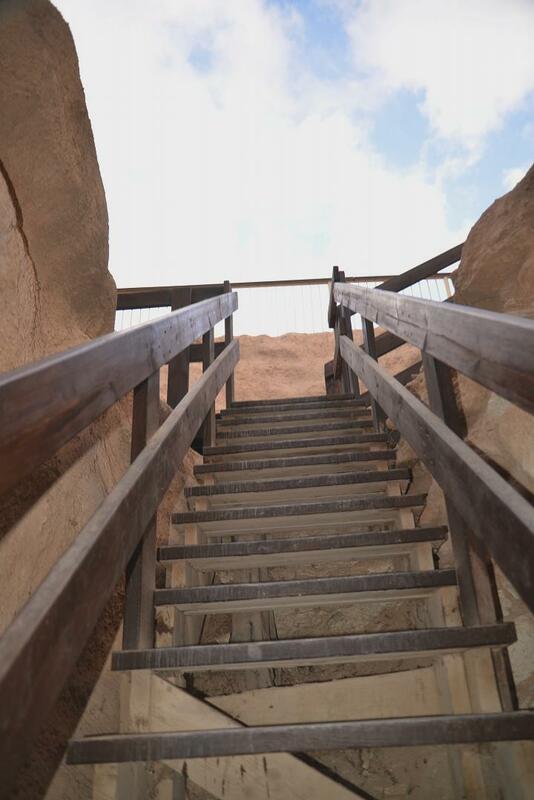 Since the level of the reservoir is lower than the valley, the engineers dug a shaft and staircase to descend to the water level. The location of the shaft is illustrated on the right, marked as a red square on the plan. 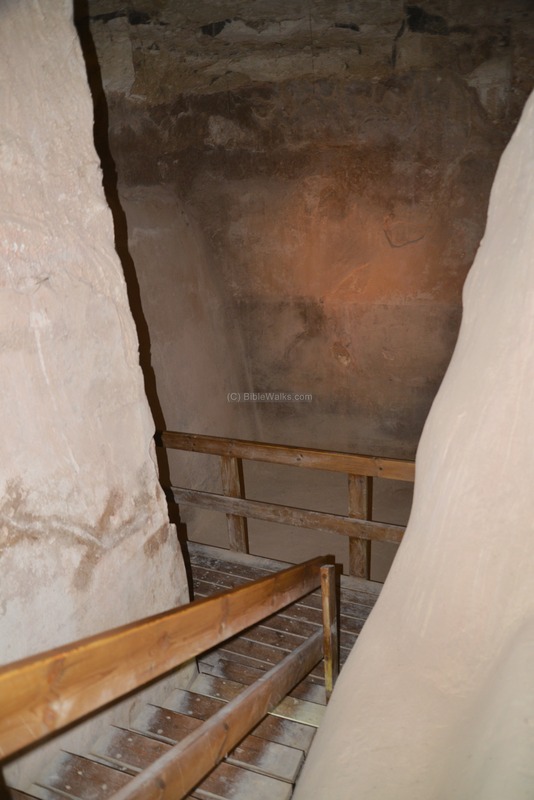 The tour ends by stepping down the shaft, starting from the staircase seen in the photo. On the sides of the shaft is a drainage channel, that led the rainfall water down into the reservoir. The shaft is 17m deep, and stairs along its sides support the access. The shaft is lined with stones. The flight of stones are located on the sides of the shaft. In order to walk down into the underground water system, the visitors are handed hard hats to protect against a possible fall of an object from the top. The entrance door is finally reached at the bottom of the shaft. 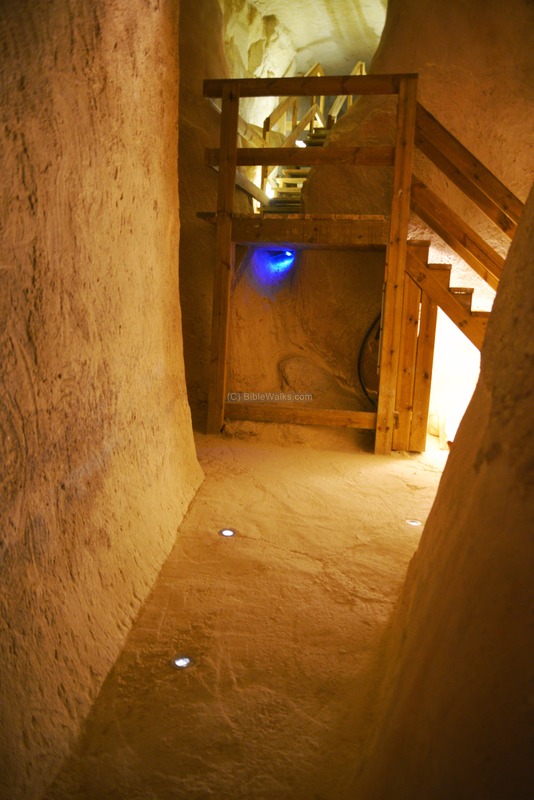 The underground reservoir is hewn into the soft chalk, 40m under the city level. It is composed of five spaces, holding a capacity of 700m3 (184,000 gallons). The location of the underground water reservoir is illustrated on the right, marked as a red square on the plan. 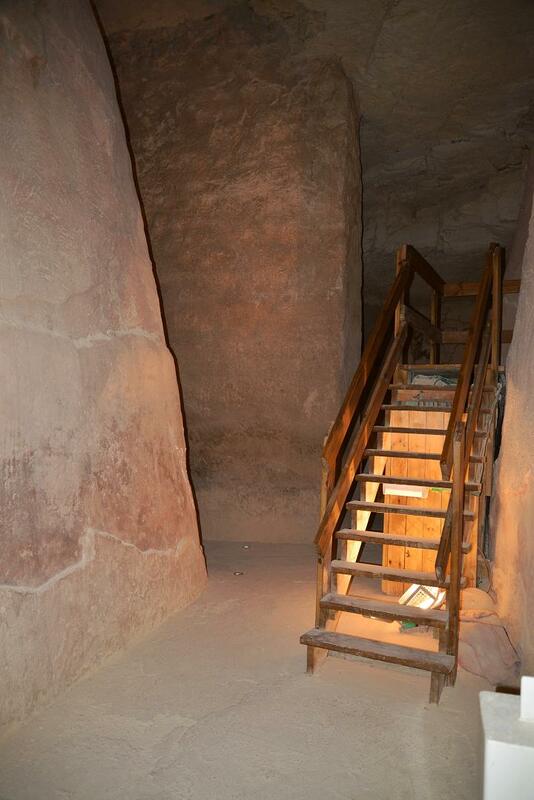 The underground staircase leads down from the entrance to the level of the cisterns. There are five large spaces. 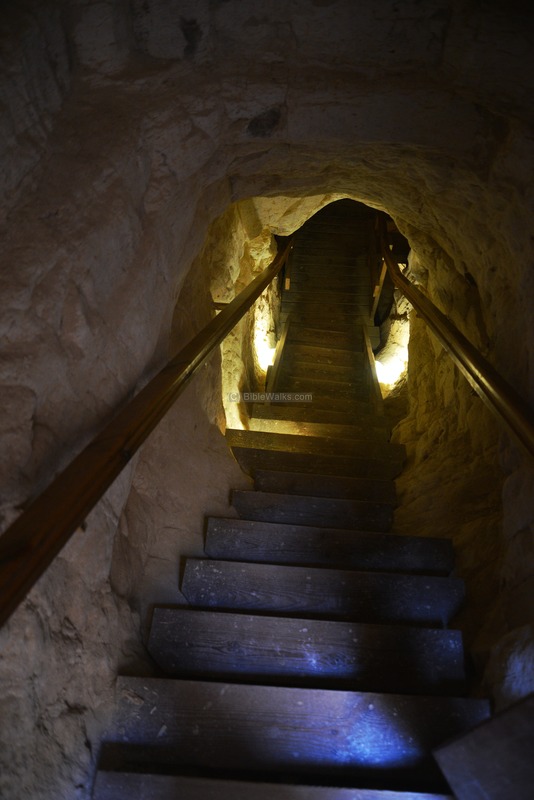 The route is well illuminated and easily accessed via the wooden staircase. The reservoirs are cut into the chalk rock, and heavily plastered in order to preserve the water. The water system was erected in the 9th Century (Stratum 4,5) and renewed in the 8th Century B.C. (Stratum 2,3). The water system collapsed and was blocked at the end of the Hellenistic period, probably as a result of an earthquake. 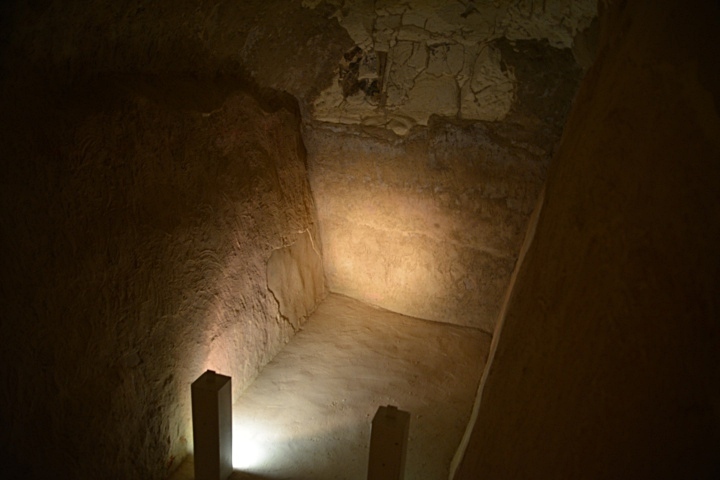 In the following chamber, you can notice the upper side is made of chalk rock, while the lower side is heavily plastered. 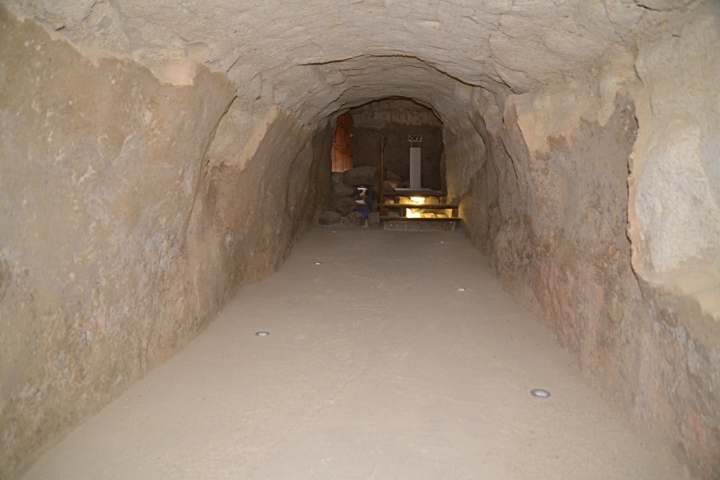 Exit from the underground chambers is via a tunnel which was hewn during the construction of the system, and was blocked after its completion. A staircase leads the visitors out to the northeast corner of the mound. The exit of the water system is seen in the next photograph, with the mound in the background. A feeder channel is located on the north side of the exit. It led flood waters from the Hebron stream into the reservoir.